TRIVIA: Under the cities listed as publishing locations for Pocket Books, you will find Gotham City. The Justice League's assistance with a crumbling dam in Gotham City leads to the discovery of an Aztek style pyramid underground. However, a month later, a research expedition to the pyramid goes terribly wrong. A student is possessed, and a professor is killed. Soon, a mysterious blue light begins testing the League, leaving death and destruction in its wake. Batman tracks the disturbance to the pyramid, but when the League attempts to stop it, it ensnares their minds and bodies... Then vanishes. Only Batman's supreme control of his own mind allows him to escape the induced terror produced by the psychic power of the spirit within. Meanwhile, an empath known to Batman, Madame Cassandra, is having visions of a bull-headed figure menacing the planet. A figure called Stone King. And Cassandra's visions indicate that they have only two days to save the world, for come midnight on Halloween, will be the end of the world. But even the assistance of Madame Cassandra and J'onn J'onzz will not be enough. To save the world, to fight horror with horror, to rescue the Justice League, Batman will be forced into an unholy bargan with the master of fear... SCARECROW! Story - 3: Batman generally works best when facing more realistic enemies. In this story, he's forced to fight the supernatural. He's out of his depth, and he knows it. It bothers me that he didn't immediately call in every mystic to ever serve with the JLA, and instead went it alone, and turned to an enemy for help. This story also serves as an aftermath to the Cataclysm storyline from the Batman comics a few years prior. Early on, Batman is shown dealing with one side effect of the earthquake, the escape of the Ratcatcher. Later, he thinks about how Gotham is still recovering from a quake years later. The problem here is that the threat the Stone King presents is simply too large for the planet to simply return to business as usual. But it does. He releases earthquakes, volcanoes, blackouts... all on a global scale. But in three weeks, things are more or less as they were. If Gotham is still recovering from one quake, how can the entire freaking planet be as it was? MILLIONS DIE, TENS OF MILLIONS MORE INJURED, and yet the JLA is utterly unaffected by the sheer scope of the tragedy. They're more concerned with why Batman and J'onn took out Green Lantern before the final battle. And it just rings remarkably false. Hello, this is practically a Crisis level body count, and they're worried over THAT?! Also annoying is that, while the reserves are called in, we are never shown any of them. Telling and not showing is the least effective method of conveying action in a series like this. As far as Superman goes, he's actually portrayed well. He knows when to lead, and when to follow. He gets some nice action sequences, including diving into the Earth's core with Wonder Woman and digging a gigantic new channel for the dam water. It's also easy to believe he'd fall to the mental powers of the Stone King, seeing as they're mystical in nature, and thus far more effective than normal against him. Still, overall, I rather enjoyed the use of Scarecrow and Ratcatcher, as well as continuity, and a nice little side mystery that doesn't get announced. Makes the reader think. Brought up the score. 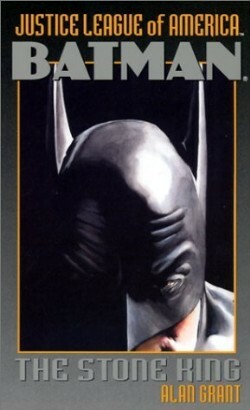 Cover Art - 2: The top half of Batman's head. Ooh. Scary. Recycled art, nothing to do with the story. YAWN.